In the past, a “header” in web design typically referred to the ever-present strip at the top of websites that contained the logo, navigation bar, and maybe some contact details and search bar. Nowadays, a “header” refers more often to the entire space above the fold on the home page. Unless someone’s found your site through a blog post shared on social media or from a referral on another site, chances are good they will enter it through the home page. And the first thing they’ll see is that prime real estate up top, laid bare. I’ve written before about how visitors respond better to the predictable placement of certain elements on your website (like the logo and CTA). By designing a website with the goal of meeting their expectations and enhancing their comfort by making the experience somewhat more predictable, you can effectively improve click-through and conversion rates. Now think about that header space on the home page. What exactly is a “header” these days? Most people have come to rely on home pages to give them a bird’s-eye view of what a company or website is about, which means you can’t afford to waste this opportunity to deliver on that expectation. 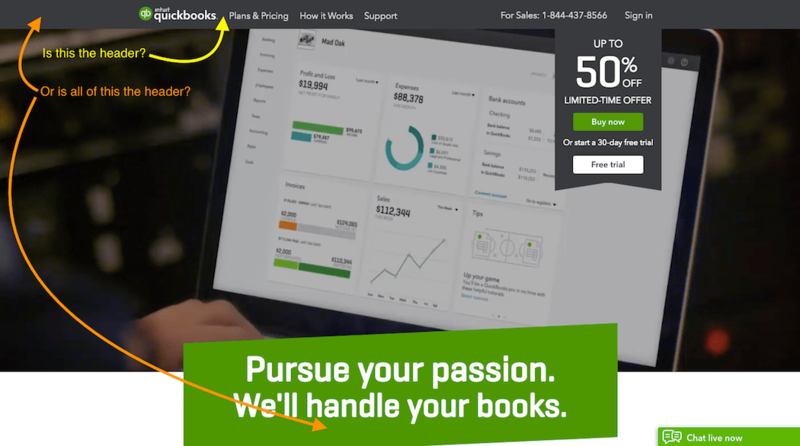 Of course, your home page header design can be unique to your brand, but the elements found within it really shouldn’t be. Visitors expect scrolling won’t be necessary in order to find out what a site will do for them. In essence, your header should be a 10-second story that proves to your visitors what value the site will be to them. So, what will you do with this space to captivate your visitors’ interest? Let’s talk about some of the trends in header design in 2017, what you can do to make use of this highly visible real estate, and take a look at some interesting examples of headers along the way. It’s not like your visitors are unaware of their ability to scroll down a page or to click through a navigation in order to learn more about the brand behind a site. But why should they have to do that? There is enough room in the header to provide a succinct message that tells them everything they need to know. And if 50 words or less isn’t enough, the background image or design will communicate the rest of the story. Above all else, the home page header can make or break your visitors’ first impressions, which is why it’s so important to nail this section. Some headers, like Cleverbird Creative’s, are huge. Thanks to the modular style of designing sites in order to be responsive, most designs are now broken up into distinct blocks and sections. This style of design happens to lend itself well to these full-width hero images that populate so many websites. 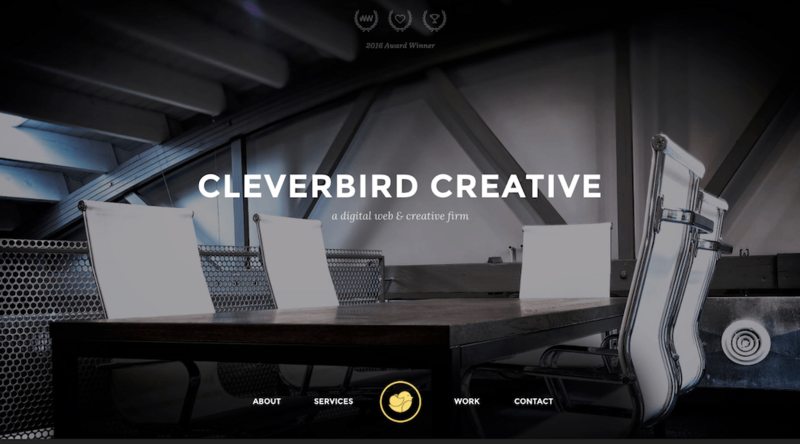 Take the Cleverbird Creative website, for example. It makes use of a singular and striking image overlaid with simple text to welcome visitors. There’s no mistake what they’re going for here: simplified beauty. I think there was a time, not too far in the past, when many of us were questioning the slider as a viable design element. However, many designers have done a great job making use of it in headers. There are sliding images that automatically scroll from one beautiful high-resolution image to the next and there are those like Pierre’s that beg visitors to take control of that experience themselves. Parallax scrolling sites are just plain fun to browse. Parallax scrolling is still growing strong and the header has proven to be the perfect place to apply this sort of visual “illusion” to web designs. What you’ll see most recently, however, is designers giving their parallax scroll a transformative edge, probably to surprise visitors with the unexpected result of the scroll. The Australian UX design agency August has done just that with their header. The Le-28 header is classy. The video background is another one of those recent trends that really works best when applied to the home page header. This one from Le 28 does a great job of setting the mood for the restaurant’s website, showing off videos from the front and back of the dining establishment. +rehabstudio’s header is super modern. Although it could be argued that the hamburger menu belongs on websites viewed on mobile devices (as originally intended), there is something to be said about what that sort of navigational minimalism does for the header. The +rehabstudio website is a nice example of this. By tucking the navigation away, your immediate focus is drawn to the exciting visuals within the plus symbol… and then you realize there are small touches of animation surrounding it. If the header is the place to introduce visitors to your site, what better way to kick it off than by introducing them to the “characters” they’re going to meet along the way? 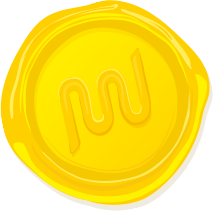 If your site uses brand mascots—as the WPMU DEV site does—this is the time and place to show them off. Strong typography can really make your content shine. There’s a lot that can be done to give your site’s typography a facelift. That said, sometimes it’s not about choosing the fanciest cursive font to throw in people’s faces. 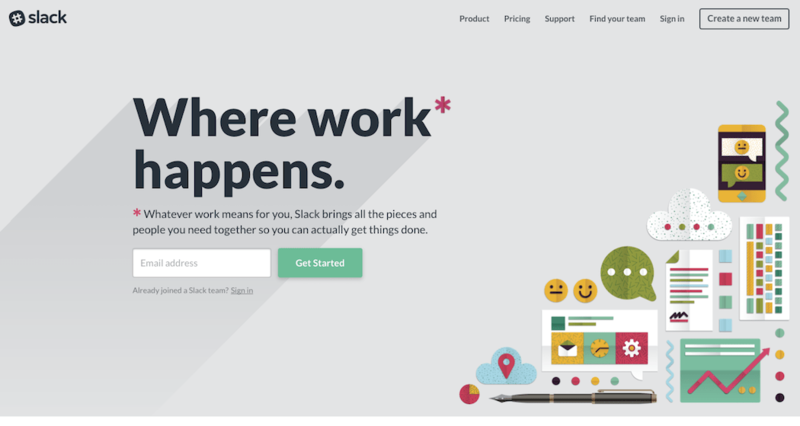 If you look at the Slack example above, you’ll see that it’s all about the size of the font. There’s nothing really special about the typography they’ve chosen, but it’s so clean and clear. That paired with the size of the main message is what makes it so eye-catching. Glamour’s home page is content-first, among other things. For websites with a primary focus on delivering droves of content to visitors (think of any major news site or blog), a content first strategy for the header will make the most sense. There’s really no point in mincing words here. People have come to your site to read your content, they don’t need to be bogged down by additional reading on the home page, so you can get right to it as Glamour does. Meanwhile, Apple’s focus is its latest big product. Along those same lines, e-commerce sites don’t need to bother using the header to write a catchy headline or provide a video explainer about the company. Visitors know what they’ve come to the site for, so you can get right into it. Unlike with content providers, however, product retailers can use this prime real estate to show off their top-selling products or newest releases to entice visitors onwards like Apple does. The Everywhereist directs visitors to click its bold CTA. There may come a time when your site has something truly special to show off to visitors, something you want them to download or buy. 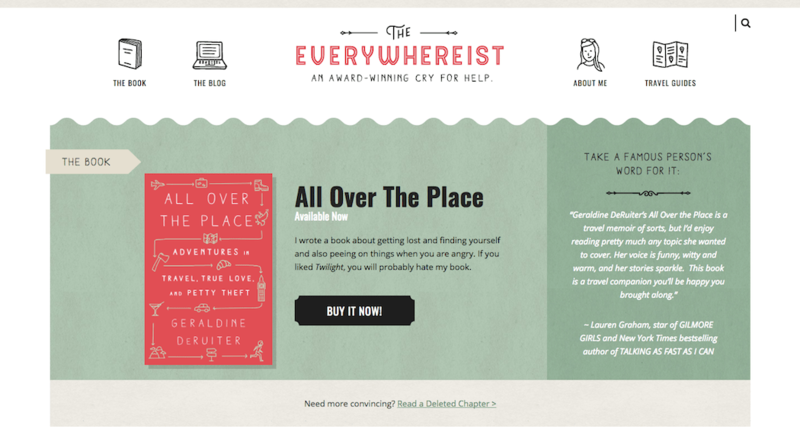 Now, even though that might not be the main attraction of your site, you can use the header either temporarily or permanently to highlight this special call-to-action as the Everywhereist blogger does with her book. Perhaps one of the nicest things to come out of Google Material Design is our willingness to use more vibrant colors, layers, and gradients in web design. 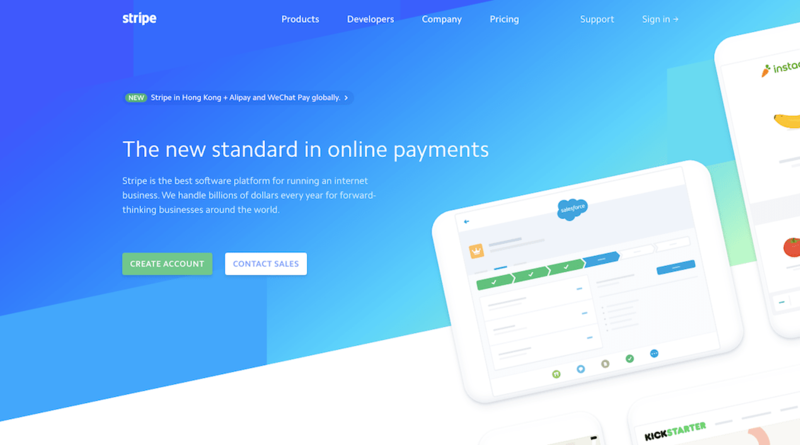 They no longer have to be relegated to call-to-action buttons, they can be used for entire blocks on the website, as Stripe does with their colorful and texturized header. There’s absolutely nothing wrong with having a static home page header design, especially if you want the focus to be drawn to a CTA or video. Keep it simple so there are no distractions keeping visitors from taking the action you intended them to. But for websites that want an interesting way to share their message with readers, animations could be a wise choice. The Baianat uses a small animation to share a number of messages within the same space, which keeps it from looking cluttered or overcrowded with information. Perspective API’s stripped back header. Geometric web design happens to be really big right now as it lends itself well to the logical and clean lines needed for responsive design. So it’s no surprise that we’re seeing more websites, like the one for Perspective API, integrate geometric elements into the header’s design. There are others, like Stripe and WPMU DEV, that use diagonal lines to create a unique and unexpected visual landscape for visitors. Teamgeek’s header is weird and fun. Finally, we come to experimental header designs. The key to these usually isn’t that the header be outlandishly strange and unusual. That would be too distracting for visitors. Instead, your focus should be on creating some unexpected effect caused by the simple movement across the header. 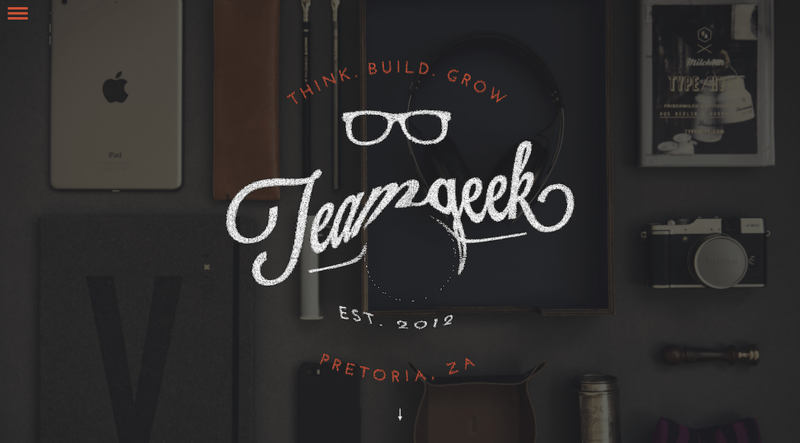 Take the Teamgeek design, for example. You can see that there’s something “off” about the logo and message within the center of the page, but it’s not until you engage with it that you realize there’s a special twist built in. You may find other items that belong in this top header section of your home page, too. It really just boils down to what makes the most sense for your site. In other words, which elements will tell your brand’s story, educate and engage your audience straight out the gate, and inspire enough trust to propel them forward through your site? Over to you: Is there any design element you absolutely refuse to put in the header of a website’s home page? I could play with that Team Geek logo all day! Nope. Not headers. Headers appear on all pages of the site. Even your own site, the is clearly defined in the source code. That’s not necessarily true any more. I’ve been doing this since 1994 and a lot has changed since then (including what’s considered “standard” like in this case). We want our client’s sites to stand out from their competitors and often that means straying from the same old cookie cutter designs that our competitors are using – and it makes it a LOT easier to close deals. Nice roundup. Think it’s worth noting that the main argument against sliders was/is really against using them to convey *important* information. They can look good and have initial impact, but beyond that, they’re just distracting. The same goes for hidden navigation and (overly) experimental stuff, really. These have their place, but on business sites can all-too-easily violate the “Don’t make me think” principle, leading to lost sales. Agreed. Slider just add extra weight to a page and nothing more. Usually only the first slide is seen, by most site visitors. Only a small percentage will wait or will slide to the next hidden slides. How these nice headers lead to order conversion? How these nice headers behave on a smartphone? How these nice headers lead to a high ranking by Google? I think the lean “Content first (8)” header will be the best for commercial purpose and the rest is only good for the turnover of webside designers and to make the CEO happy with a nice but useless infopage. – How these nice headers lead to order conversion? – How these nice headers behave on a smartphone? There’re different techniques that could be used for mobile views, depending on the actual header used of course. The most common though, is a grid system which places columns side-by-side in desktop, and stack them in smaller viewports. – How these nice headers lead to a high ranking by Google? “Content first” may be the most logic selection, but again can’t be applied in all cases, especially in websites where content isn’t the main options, like a service or App site. I am a logo designer, personally, sometimes I need to redesign my designed logos according to my client’s requirement. is an awesome online logo maker. This is so much easy to use. The most benefit to use it is: designers can save time & also can receive quality designs with logoai.com in a few minutes!